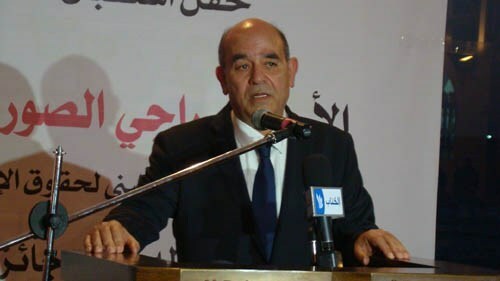 Head of the Palestinian Center for Human Rights (PCHR) Raji Sourani stated Monday that UN Special Coordinator for the Middle East Peace Process Robert Serry’s plan for the reconstruction of Gaza institutionalizes Israel’s siege on the Strip. During his meeting with the German Federal Government Commissioner for Human Rights Policy and Humanitarian Aid at the Federal Foreign Office Christoph Strässer, Sourani confirmed that the UN plan for the reconstruction of Gaza in coordination with the Israeli and Palestinian authorities is a new attempt to “institutionalize the siege”. He warned that the siege has become strategic, saying that Gaza’s reconstruction is an impossible mission in light of the continued blockade. The Palestinian human rights activist accused the unity government of not bearing its responsibilities towards the besieged Strip. He also pointed out that the Egyptian authorities’ closure of the Rafah crossing has doubled the suffering of the people of Gaza. Four months have passed since the end of Israeli summer aggression on Gaza, however nothing has been achieved as far as the reconstruction is concerned, he continued. He briefed the German delegation about the human rights violations reported in the Strip after the last aggression, pointing to his center’s efforts along with a number of Palestinian human rights centers to prosecute Israeli war criminals and to document human rights violations with the International Criminal Court (ICC). He said that Israel has practiced and is still practicing “the law of the jungle” against the people of Gaza. Sourani pointed to the catastrophic humanitarian conditions in the besieged Strip, stressing the urgent need to provide international protection for the civilians in Gaza during times of war according to international laws and the Fourth Geneva Convention. A recent opinion poll found out rising support for Hamas, with leader Ismail Haneyya preferred as president to incumbent Mahmoud Abbas. A poll conducted by the Ramallah-based Palestinian Center for Policy and Survey, whose findings were released Wednesday, suggested Hamas would win Palestinian elections if they were held today and the group’s leader Ismail Haneyya would win a sweeping majority over Abbas and prisoner Marwan al-Barghouthi in a three-way presidential race. Head of the center said Abbas, and not Hamas, stands as a stumbling block in any projected move towards a new presidential race. 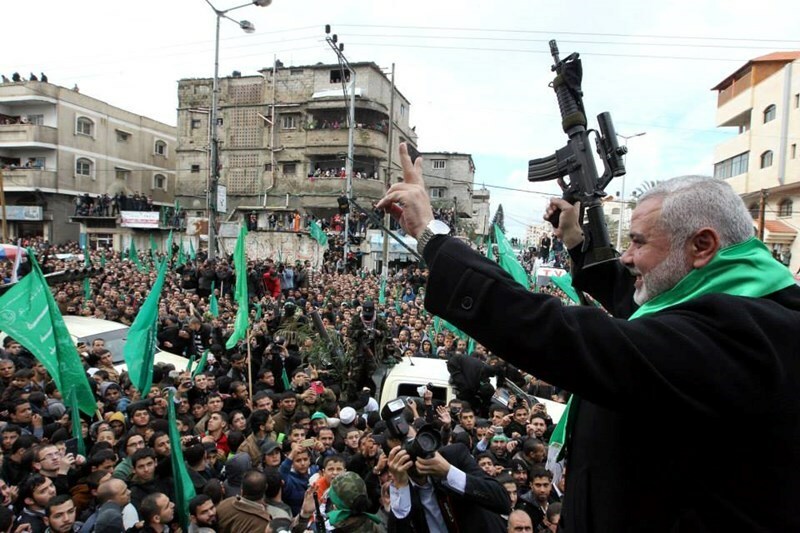 The poll showed an unprecedented upsurge in support for Hamas’s armed resistance, with 77% of the respondents voicing firm support for Hamas’s launch of rocket attacks against the Israeli occupation as long as the blockade tightened around Gazans’ necks is not lifted. More than half of the respondents said they opposed the disarmament of Hamas in Gaza. 86% of respondents said they believed Muslims’ holy al-Aqsa Mosque is in serious jeopardy; 77% said the Israeli occupation intends to destroy the Mosque and build the alleged temple on its ruins. In its Weekly Report On Israeli Human Rights Violations in the Occupied Palestinian Territories for the week of 24- 30 Dec. 2014, the Palestinian Center for Human Rights (PCHR) found that Israeli forces continue systematic attacks against Palestinian civilians and property in the Occupied Palestinian Territories, with 4 dead this week from Israeli attacks and 17 wounded. 3 of the dead and 16 of the wounded were civilian non-combatants, and 2 of the dead were children. Over the past week, Israeli forces killed a Palestinian child and wounded another one south of Nablus. Israeli forces continued to open fire at border areas in the Gaza Strip. A Palestinian militant was killed and another one was wounded when an Israeli drone targeted them, east of Khan Yunis. 3 Palestinian civilians, including a child, were wounded in the north of the Gaza Strip. In addition, a Palestinian child died of wounds he sustained during the latest Israeli offensive on the Gaza Strip, and an elderly man died of wounds he sustained in occupied Jerusalem. Israeli forces continued to use force against peaceful protests in the West Bank. 3 Palestinian civilians were wounded during Kufor Qaddoum protest, northeast of Qalqilya. 3 Palestinian children were wounded during other protests. 6 Palestinian civilians, including a child and 2 women, were wounded during several shooting incidents. A child was wounded due to the explosion of a sound bomb of the Israeli military remnants. Israeli forces conducted 65 incursions into Palestinian communities in the West Bank, abducting 61 Palestinian civilians, including 14 children and 2 women. 16 of these civilians, including 8 children and 2 woman, were abducted in occupied Jerusalem. Israeli forces established dozens of checkpoints in the West Bank. At least 3 Palestinian civilians were abducted at military checkpoints in the West Bank. In the West Bank, in excessive use of force, on 29 December 2014, Israeli forces killed a Palestinian child and wounded another one in Beita village, southeast of Nablus. The 2 children were walking on a highland and the area was quiet then. Israeli forces could have abducted the children and questioned them in case of suspicion. On 30 December 2014, a medical source in a hospital in West Jerusalem pronounced a 62-year-old Palestinian civilian, from Jerusalem Old City, dead of wounds he sustained during the funeral of Mohammed Sonoqrot on 07 September 2014. On 24 December 2014, an Israeli soldier fired a rubber-coated metal bullet at a 5-year-old child while being in the yard of his family house in al-'Eisawiya village, north of east Jerusalem. As a result, the child sustained a wound to the eye. On 26 December 2014, a 72-year-old woman sustained a bullet wound to the right arm and another 48-year-old woman sustained a bullet wound to the right arm but the bullet settled in the belly, when Israeli forces moved into Far'oun village, south of Tulkarm. On 28 December 2014, an 8-year-old child, from al-Nabi Saleh village northwest of Ramallah, sustained wounds to the left eyebrow and left hand middle finger and burns to the right hand pointer finger, due to the explosion of a sound bomb of the Israeli military remnants. On 29 December 2014, Israeli forces stationed at the entrance of Beit Ommar village, north of Hebron, opened fire at a Palestinian vehicle driven by 2 Palestinian civilians while going back to the village. As a result, the 2 civilians were wounded. The 2 wounded were taken to al-Ahli hospital in Hebron. Wounds of one of them were described as serious. On 30 December 2014, a Palestinian child was wounded when Israeli forces protecting settlers, who attacked Palestinian houses in Burin village, south of Nablus, opened fire at Palestinian civilians, who confronted the settlers. Israeli forces continued their measures to create Jewish majority in occupied Jerusalem. 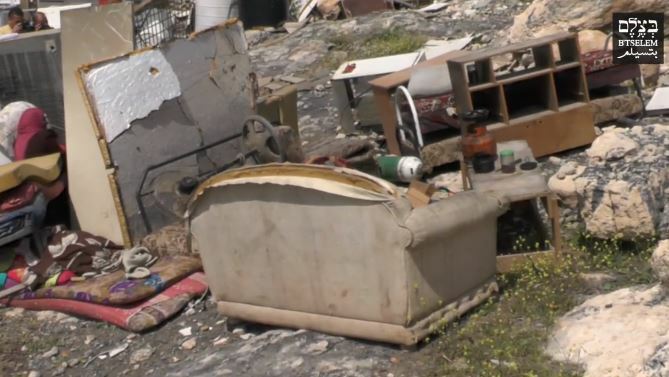 Israeli forces demolished 3 houses, a butchery and a restaurant in Jabal al-Mukabber neighborhood. In an incident documented by a PCHR fieldworker, on December 25th, Israeli troops stole money from a Palestinian woman, Mai Rashad Anis Shbeiri, during a raid of his home. Shbeiri said to a PCHR fieldworker that: "At approximately 01:30 on Thursday, 25 December 2014, my husband, Ahmed 'Ali Ahmed Shbeiri (52), sons; 'Abdullah (20), 'Obadah (18), 'Inayah (21), and 'Abdel Rahman (13), and I were sleeping in our house in al-Qaryoun neighbourhood in Nablus. We woke up to the voice of Israeli soldiers' steps on our dilapidated old house roof. They suddenly pushed the door house with their feet without knocking, so I got up out of bed to the living room. An Israeli soldier then asked me who the owner of the house is, and I then called my husband to come. He came and brought his ID card. The Israeli officer asked us to call for all those in the house and kept us in the guest room under the eyes of two Israeli soldiers. Other Israeli soldiers searched the house and when they reached the room we were staying in, they asked us to leave to our sons' room on the opposite side. While we were passing by my room, I noticed that my closet's lock has been broken. I told my husband who then told the Israeli soldiers that there is 70,000 NIS in the closet and he wants to get them. We were surprised that one of the soldiers brought it inside a plastic bag. They then asked my husband where he got that money from, and he answered that he is a candy and sweets trader and this money is for the goods. The Israeli soldiers gave him the money and took a photo for him with a black cell phone while receiving the money. After 20 minutes of receiving the money, two Israeli soldiers came back to question my husband again about the money. After arguing for hours, the Israeli soldiers were not convinced. They then abducted my son, 'Abdullah, and confiscated 70,000 NIS." In the Gaza Strip, on 24 December 2014, a Palestinian militant was killed and another one was wounded when an Israeli drone targeted them, east of Khan Yunis, south of the Gaza Strip. Israeli forces opened fire at al-Sanati area, northeast of Khuza'a village for about 45 minutes, but no casualties were reported. However, Israeli forces claimed that an Israeli soldier was wounded as a Palestinian sniper fired at him. On 25 December 2014, a Palestinian medical source pronounced a 15-year-old child dead of wounds he sustained on 30 July 2014, during the latest Israeli offensive. On 28 December 2014, 3 Palestinian civilians, including a child, were wounded when Israeli forces stationed on watchtowers in and around Beit Hanoun crossing, north of the Gaza Strip, opened fire at a group of Palestinian civilians near the border fence, who participated in protests called for by Islamic and national powers to end the Israeli closure and reconstruct the Gaza Strip. Israeli navy forces continued to target Palestinian fishermen in the Gaza Strip sea. In the context of targeting Palestinian fishermen in the Gaza Strip, on 25 December 2014, Israeli gunboats opened fire at fishing boats sailing within 4 nautical miles limit, north of the Gaza Strip. However, neither casualties nor material damage were reported. Israel continued to impose a total closure on the Occupied Palestinian Territories and has isolated the Gaza Strip from the outside world. On 24 December 2014, Israeli forces bulldozed 3 retaining walls in Qasra village, southeast of Nablus. 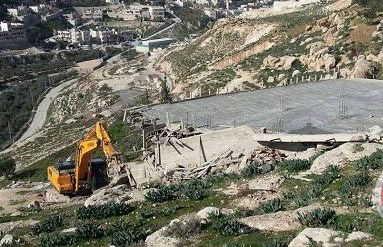 They also bulldozed a tin barn used for raising poultry in al-Ras area, west of Hebron, and another shed used for collecting scrap. On 25 December 2014, Israeli forces bulldozed a tin barracks and a two-floor building used as a cowshed and a dairy factory in Doura, west of Hebron. It should be noted that the aforementioned facilities are located near the annexation wall which is established on the lands of Hebron. On 26 December 2014, Israeli settlers moved into the lands of Silat al-Zaher area to perform Talmudic rituals. On 27 December 2014, a number of settlers from “Susia” settlement, south of Hebron destroyed 2 acres of winter crops after spraying them with chemicals. On 29 December 2014, the security guards of “Ofra” settlement attacked a 29-year-old civilian from Silwad village. As a result, he sustained bruises throughout his body. Israeli forces used excessive force against peaceful protests organised by Palestinian civilians, international and Israeli human rights defenders in protest at the construction of the annexation wall and settlement activities in the West Bank. As a result, 3 civilians were wounded during Kufor Qaddoum protest, northeast of Qalqilya. In the same context, 3 children were wounded during other protests throughout the West Bank in protest at the Israeli attacks against Palestinian civilians and property, especially in East Jerusalem. Following the Friday prayer, on 26 December 2014, dozens of Palestinian civilians and international and Israeli human rights defenders organized a peaceful demonstration in Bil’in, west of Ramallah, in protest at the construction of the annexation wall and settlement activities. The demonstrators took the streets raising the Palestinian flags and headed to the liberated territories near the annexation wall. Early in the morning, Israeli forces closed all entrances to the city to prevent Palestinian civilians and international and Israeli human rights defenders from participating in the protests. Protestors marched by the annexation wall and tried to cross the fence. Israeli soldiers stationed behind the wall, in the western area, and a large number of soldiers deployed along it, fired live bullets, tear gas canisters, rubber-coated steel bullets, sound bombs and wastewater at them and chased them into the olive fields. As a result, a number of demonstrators suffered tear gas inhalation and others sustained bruises as Israeli soldiers beat them up. On the same day, dozens of Palestinian civilians organised a peaceful demonstration in the centre of Ni’lin village, west of Ramallah, in protest at the construction of the annexation wall and settlement activities. The demonstrators took the streets and headed to the annexation wall. Israeli forces closed the gates of the wall with barbwires and prevented the demonstrators from crossing to the land behind it before they responded by throwing stones. Israeli soldiers fired live ammunition, rubber-coated metal bullets, sound bombs and tear gas canisters at the civilians, and chased them into the village. As a result, many civilians suffered tear gas inhalation and others sustained bruises as Israeli soldiers beat them up. Around the same time, dozens of Palestinian civilians and Israeli and international human rights defenders organised a peaceful demonstration in al-Nabi Saleh village, southwest of Ramallah, in protest at the construction of the annexation wall and settlement activities. The demonstrators made their way in the streets raising the Palestinian flags and chanting slogans against the occupation and in support of the Palestinian unity resistance, and then they headed to the lands that the settlers are trying to rob by force near “Halmish” settlement. Israeli forces had closed all the entrances of the village since the morning to prevent Palestinian and international activists and journalists from participating in the demonstration. When they arrived at the aforementioned land, demonstrators were met by live bullets, tear gas canisters, rubber-coated steel bullets, sound bombs and skunk water and were chased into the village. As a result, many demonstrators suffered tear gas inhalation and other sustained bruises as Israeli soldiers beat them up. Also at approximately 13:20, Palestinian civilians and international solidarity activists organized a protest in the center of Kufor Qaddoum village, northeast of Qalqilya, heading to the eastern entrance of the village in protest against closing that entrance since the beginning of al-Aqsa Intifada with an iron gate. The demonstrators threw stones at Israeli soldiers, who fired sound bombs and tear gas canisters in response. As a result, many demonstrators suffered tear gas inhalation and other sustained bruises as Israeli soldiers beat them up. Moreover, a 46-year-old male was hit by a gas canister to the back; a 53-year-old civilian was hit by a gas canister to the back too; and a 19-year-old civilian sustained a bullet wound to the left leg. At approximately 15:30, on 24 December 2014, a protest moved from the centre of Beit Foreek village, east of Nablus, towards lands threatened to be confiscated in al-Naqar area, near "Etamar" settlement, southeast of the said village. The demonstrators were surprised to find Israeli forces stationing in the area. The Palestinian youngsters threw stones at Israeli soldiers, who opened fire in response. As a result, a 15-year-old male sustained a bullet wound to the right leg and another 16-year-old male sustained bullet wound to the right side of the chest. The 2 wounded persons were taken to Rafidya hospital in Nablus to receive the necessary medical treatment. A medical source stated that their health condition was settled. Following Friday prayer, on 26 December 2014, dozens of Palestinian young men gathered from different areas in Ramallah and al-Bireh around Ofer detention facility, southwest of Ramallah. They made their way towards the facility's gate, which was closed by Israeli soldiers. The protestors set fire to tires and threw stones and empty bottles at Israeli soldiers, who fired live ammunition, rubber-coated metal bullets, sound bombs and tear gas canisters in response. As a result, 17-year-old child sustained a bullet wound above the right knee. He was taken to Palestine Medical Compound in Ramallah. On the same day, dozens of Palestinian civilians gathered at the western entrance of Selwad village, northeast of Ramallah, on Selwad-Yabroud road near street (60) to organize a protest against Israeli policies. The protestors set fire to tires and threw stones and empty bottles at Israeli soldiers, who fired live ammunition, rubber-coated metal bullets, sound bombs and tear gas canisters in response. As a result, a number of protestors suffered tear gas inhalation, and others sustained bruises as Israeli soldiers beat them up. B'Tselem: "Israel Demolished 188 Homes In 2014"
The Israeli Information Center for Human Rights in the Occupied Territories (B’Tselem) has reported that the Israeli authorities demolished, in the year 2014, 188 Palestinian homes in the West Bank and East Jerusalem, rendering 882 persons, including 463 children, homeless. ---- Area C covers 60% of the West Bank and is home to an estimated 180,000-300,000 Palestinians and to a settler population of at least 325,500 living in 125 settlements and approx. 100 outposts. Al Aqsa Association for Waqf and Heritage has reported that Israelis carried out some 86 assaults and violations of Islamic and Christian Palestinian holy sites in the occupied West Bank and Jerusalem in 2014. In a report published Wednesday, the association stated that about 30 cases of assault on mosques, 21 cases of assault on graveyards, six cases of attacks on Christian holy sites, and other sporadic attacks, including preventing the call for prayer in Hebron's Ibrahimi Mosque hundreds of times -- amounting to dozens a month -- were documented. To the previous list, the association added the complete destruction of 73 mosques, the partial vandalism of 197 mosques, and damage of one church during this past summer's war on Gaza. Al-Aqsa Association recorded five cases of burning mosques or parts of them, including the burning of Ali bin Abi Talib mosque in the village of Deir Estia, in Salfit, spraying of racist slogans on a shrine in Anata town near Jerusalem, Abu Bakr mosqe in Umm al-Fahm, and Abu Bakr mosque in the town of Aqraba, south of Nablus, and the Great Western mosque al-Mughayir village in Ramallah. Other incidents were recorded such as the attacks on two mosques and Islamic shrines with racist writings and Talmudic words. The report also documented the demolishing of five mosques in Nablus, Jerusalem and Naqab. Meanwhile, six cases of assault on Christian holy sites were also recorded by the association. 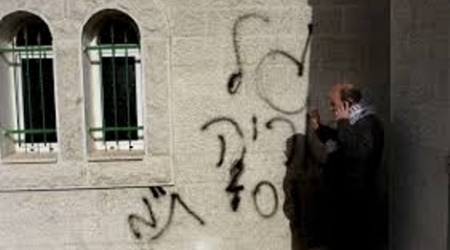 In April, "price tag" groups vandalized a monastery in Rafat, to the west of Jerusalem, while an extremist Israeli threatened a priest in Nazareth. Another incident happened in the same month, when price tag groups sprayed racist comments near the Roman church in Jerusalem. In May, Israeli extremists sprayed offensive comments about Jesus Christ near a church in Beersheba. Meanwhile, other Israelis wrote offensive comments about the prophet Mohammad and Jesus, an incident which coincided with the Holy See’s visit to Palestine. The report also recorded 18 attacks against mosques in Hebron and Bethlehem, while other attacks which were documented targeted Muslim’s graveyards, such as smashing gravestones, stealing monuments, spraying racist comments, confiscating yards and selling the land to build commercial malls. According to the report, in 2014, Israeli forces and settler efforts increased to take control over Waqf land to turn it into Jewish shrines; among these attempts were putting up fake gravestones and raiding the sites. As for the Ibrahimi Mosque, which is targeted on daily basis, the call for prayer was prevented more than 250 times under the pretext that it annoys Israeli settlers. The violations include preventing worshipers from entering the mosque to pray. In the Gaza Strip, the Ministry of Waqf and Religious Affairs said the Israeli army destroyed 73 mosques completely, 197 partially, and one church partially. It added that six Zakat offices were completely damaged, a waqf school was bombarded and 11 graveyards were destroyed. 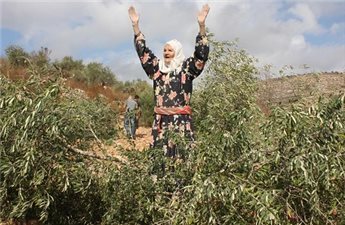 Jewish settlers have uprooted more than 5,000 olive tree saplings in lands east of the town of Turmusayya, north of Ramallah, in the central occupied West Bank, locals said Thursday. One owner of the lands targeted, Awad Abu Samra, told Ma'an Mews Agency that, over the past week, settlers have repeatedly raided the area to attack the saplings. The attacks are reportedly carried out in order to ensure that Palestinian farmers are unable to plant in the area, further disenfranchising them and, thus, forcing them to leave the land, opening it to confiscation by settlers. Mr. Abu Samra estimates that the assailants have managed to uproot around 5,000 olive tree saplings, out of a total of 8,000 that had been planted since mid-December, in the area, known as al-Zahrat. The saplings had been planted in honor of slain Palestinian official Ziad Abu Ein, who died after being beaten by an Israeli soldier, during a march to help plant trees and protest land confiscation in the area, on December 10th. Abu Samra said that the settlers who carried out the attacks most likely came from the nearby settlement of Adei Ad, an outpost of the "Jewish-only" settlement of Shilo, located nearby. Shilo was built on lands confiscated from local Palestinians. He added that, each day, settlers carried out raids in which they uprooted hundreds of saplings, under Israeli army protection, and that they had uprooted the saplings and broken their roots so as to prevent them from being replanted. Jamil al-Barghouti, president of the Resistance Committee against the Wall and the Settlements, told Ma'an that the "barbaric act" occurred under the cover and protection of the Israeli army. Barghouthi, who lives in the area, says that he has seen with his own eyes settlers attacking farmers as they worked in the area, with the aim of kicking them off the land and seizing it for the settlement. He stressed that the committee will re-plant thousands of olive trees and will provide full assistance to farmers, to help them cultivate the land again. He stressed that Ziad Abu Ein, who was head of the resistance committee until being killed earlier in December, had been "martyred" while working to plant the land and that the committee was dedicated to continuing his work. Attacks on olive trees are a key way that Palestinians are forced out of their homes and their lands confiscated for settlement construction, as the loss of a year's crop can signal destitution for many. Over 7,500 olive trees were damaged or destroyed by settlers between January and mid-October in 2012, according to the United Nations. Ma'an further reports that, since 1967, approximately 800,000 olive trees have been uprooted in the occupied West Bank, according to a joint report by the Palestinian Authority and the Applied Research Institute Jerusalem. As of mid-December, there have been some 320 reported incidents of settler violence against Palestinians in the occupied West Bank, over the year 2014, according to the UN Office for the Coordination of Humanitarian Affairs. In the South Hebron Hills, on Thursday, Israeli settlers targeted a Palestinian home in the village of Ad-Deirat, while Israeli forces demolished a tent in the village of Al-Mufaqarah.